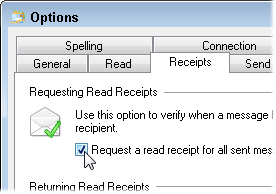 Andy Rathbone » Where’s the “request read receipt” feature in Windows Live Mail? 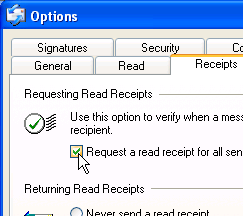 Q: Windows XP’s Outlook Express had a Request Read Receipt feature that let me know when the recipient read my e-mail. That feature seems to be missing from Windows Live Mail. Where did it go? A: That feature, called “Request a read receipt for all sent messages,” lives on in Windows Live Mail. 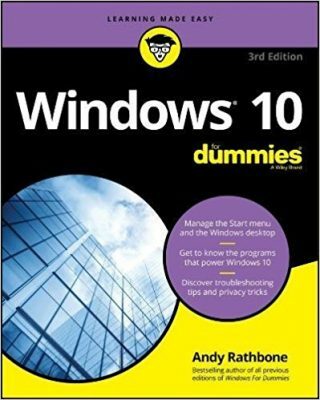 But finding it requires a different set of keystrokes. But first, some background. The Request Receipt feature emails you when the recipient opens your sent email. Theoretically, you’ll know exactly when your boss saw your e-mail asking for that raise, for example. When your e-mail recipient doesn’t use Windows Live Mail or Outlook Express. When the recipient reads the email on her smartphone rather than her computer. When the recipient clicks “No” when his email program asks permission to send the confirmation email. 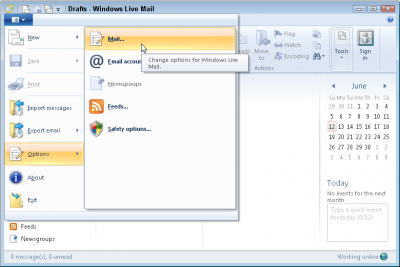 Click the Windows Live Mail main menu (it’s dark blue and unlabelled in the top, left corner), click Options, and choose Mail (shown below). When the Options menu appears (below), click the Receipts tab, and click the box called, “Request a read receipt for all sent messages. Click the OK button to save your changes and exit the menus. That turns on the return receipts feature. It’s easy to turn on, and on those few occasions when it works, it could be just what you’ve been waiting for. Ken, to request a read receipt for an individual message in Windows Live Mail, look at the ribbon menu along the top of your message. Then send the message as usual. Be aware, though, that whenever you request a read receipt, the recipient can either approve or deny the read request. In other words, checking the box doesn’t ensure that you’ll receive a notification that the recipient has read or received the mail. Some e-mail programs don’t even support the read receipt feature. I understand your comments that this will not always work. So, what is another option I can use for this purpose? > Wayne: There is no other option that I’m aware of. E-mail is based on a set of standards that doesn’t include a “request read receipt.” It only works when the sender and recipient both use an e-mail program that supports the feature. And even then, it’s not always reliable.